your Non Signed Horror Collection. 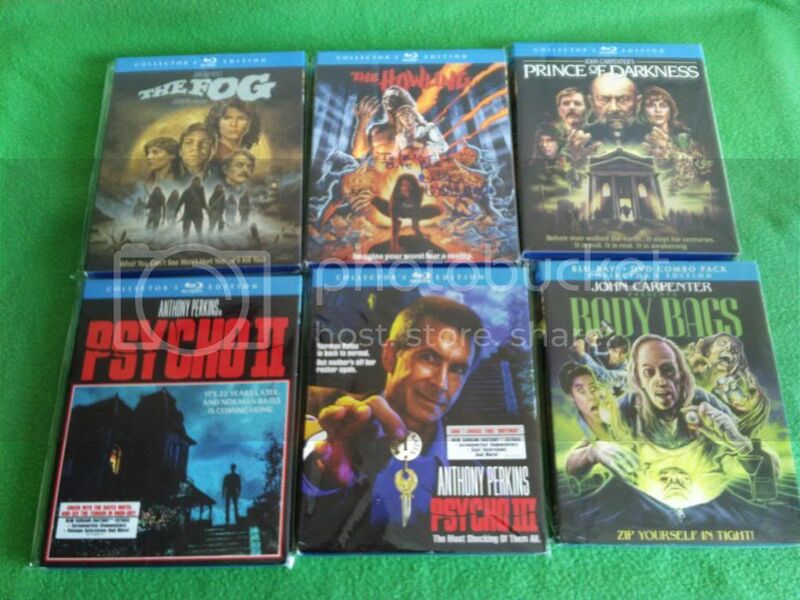 That's one hell of a bluray collection, some awesome cult stuff in there. I have to get my photobucket sorted out so I can post some photos on here, not that I have too much to show. My fave horror figure I own, though strictly not from a horror film, is a large Vincent Price figure from Edward Scissorhands. As for horror books I own, I could plug my own horror novel which is available from a certain website that shares its name with a south American river, but that would be really egotistical of me so I'm not going to even mention Draculand. So that aside, my fave horror merch in book form is my Evil Dead Necronomicon replica note pad. If they get Bruce again, that's definitely getting signed. My wife is obsessed with Tim Burton, so we have a lot of Nightmare Before Xmas and Corpse Bride figures and kitchenware about the place too. I recently got that Demons tin too; I was tempted by the Synapse blu ray releases which are the ultimate editions but why pay well over $100 when the Arrow box is so reasonably priced. ...but why pay well over $100 when the Arrow box is so reasonably priced. I thought that too until I watched the Synapse release; It is vastly superior to Arrow's (c-ock-up) release. This could end up being one MASSIVE thread if I post my whole Horror collection ! 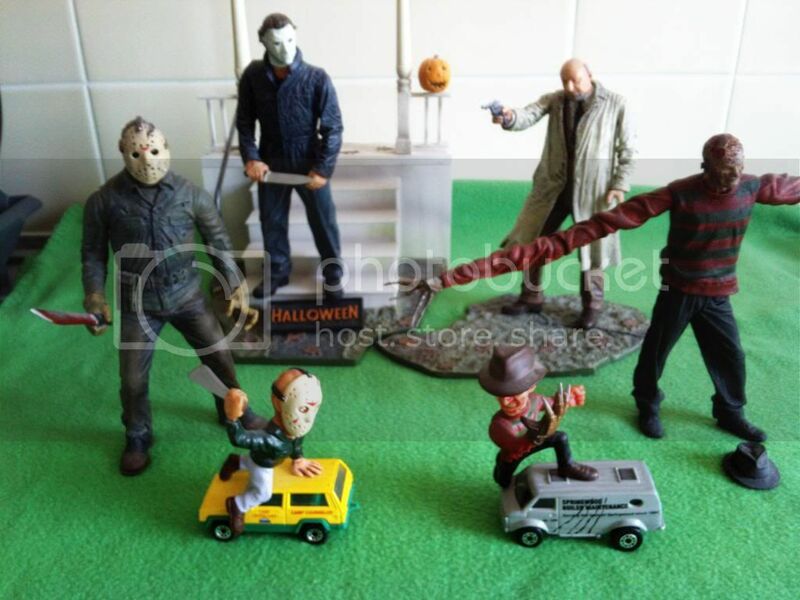 The other challenge I have is most of it is stored away in boxes sadly, rather than on display, as it seemed a bit unfair on them to make my two boys share a bedroom so I could keep my Horror shrine ! I didn't actually have a Horror Shrine but that did sound quite good, in fact I just used to use the back bedroom to store all my film related stuff, which mainly was on shelves and is now stored in boxes or in the loft ! Cheers mate. Props for being a horror novelist, too cool. Might have to give it a read late summer. The Arrow editions are great for Demons 1&2. While i rate Synapse(got Countess Dracula the other day) the steelbooks are ridiculously priced. Aside from some slight compression issues on D2 i think the Arrow release is pretty good. Not seen the Synapse versions though. You've got to show some now that collection sounds epic. They also f'd up the sound and dub too, in particular in Demons 1, the gang with the 'Pepsi' can car scene. Also, Arrow cashed in with their unofficial Demons 3 comic books. I sold my copies and bought the Synapse steelbooks instead. I'll try and get some photos posted up in the next week, just difficult to find the time to unpack it all and take photos ! I'd like to read your book! What is it about? Thanks Donald. It's a horror comedy called Draculand, I'll paste the synopsis below. As I said if anyone wants a copy just email me at my email address smcelhenny@hotmail.com and I'll send an e-version to you. When entrepreneur Edward Henning builds a horror based theme park deep in the heart of Transylvania, little does he realise that his new business partner is in fact a centuries old vampire. As the blood-thirsty vampire anticipates the arrival of the thousands of tourists to his land, he soon learns that the modern world is a far scarier place than the one he is used to. The vampire becomes a nervous wreck as he has to endure the perils of the internet, drunken employees, health and safety inspections, crooked business partners and even the Thai-Bride of Frankenstein. Draculand is a roller coaster of laughs and horrors in a fun filled ride you will not want to get off.